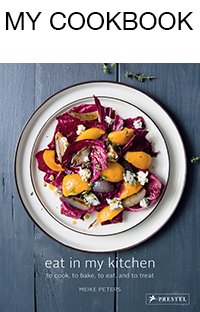 This meal celebrates roots in all their variety. 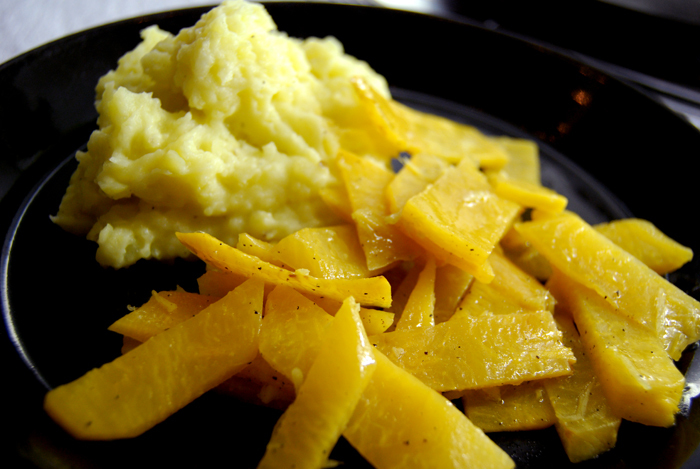 On one side, mashed potatoes which are absolutely addictive, combined with garlic and lemon. The mash is fluffy, it is tasty and it is so good that you don’t really need anything else with it but I want another root on the plate: rutabaga (also known as swede). This root gets spiced up with ginger as the two flavors combine perfectly. Winter is the time for roots and I love to try out different variations otherwise I wouldn’t be able to eat it for so many months. But there is so much you can do with it! You just have to be a bit brave and play around with it. The potato-garlic-lemon idea came up because we love mash potatoes (also in the very basic version) but I thought it would be nice to add some favors to make it more suitable for other, more extreme combinations like the gingery rutabaga for example. 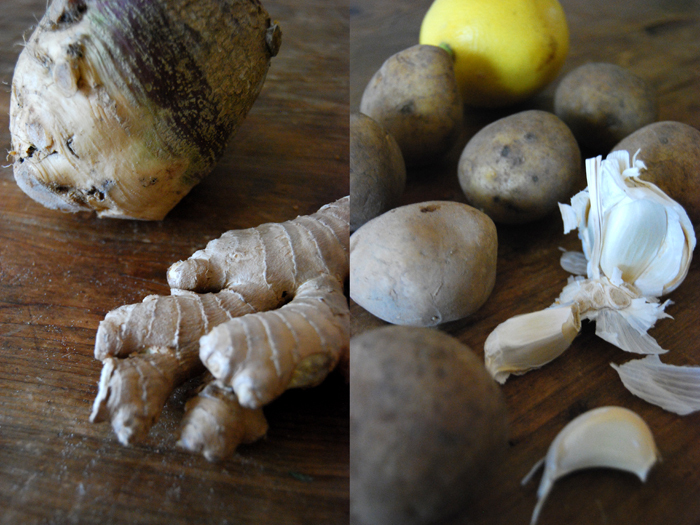 Together with garlic and lemon we can still have our mash on the plate even when there are more exotic roots involved! Heat up all the ingredients in a pot on medium heat and mash. If the mixture becomes too dry add more milk, if it is too liquid let it cook a bit more. Season with salt and pepper. Cut the rutabaga in very thin slices (about 2mm). Cut these slices in strips (1cm / 1/2″) and cut these strips in 2-3cm / 1″ pieces (see my first picture for the shape). Heat up the oil in a pan, add the rutabaga and let it become golden. Add the ginger, fry for a minute and deglaze with the wine. Add salt and pepper and a splash of water if necessary (the liquid should come up to 2cm / 1″), close with a lid and let it cook on medium heat for 15-20 minutes. Check the rutabaga in between as it shouldn’t get too soft and season with salt and pepper if necessary.